It’s difficult to imagine major mistakes happening at big spirits brands. When you think how much a single cask of a spirit is worth, there’s an extremely high incentive to make sure everything is meticulously labeled, tracked, and referenced. Sure, mistakes can happen, but it’s hard to imagine them happening at the magnitude to produce a major new release. These “oops” stories of mistaken barrels mixed together feel a lot like the old Reese’s Peanut Butter Cup commercials, “You got your chocolate in my peanut butter!” They are an instant backstory to make something new sound spontaneous and special. In truth, the purposeful mixing of two divergent spirits happens all the time, and companies like High West have built their business on it. Now, we have another major spirits company, Diageo, releasing an “oops” product. Orphan Barrel The Gifted Horse Whiskey is a supposed result of the mistaken mixing of a 17 year old Kentucky Straight Bourbon with a 4 year old whiskey at the Stitzel-Weller Distillery. 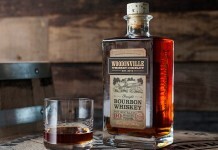 Given the smaller scope of the Orphan Barrel series, this one is slightly more plausible, but we’re still skeptical. 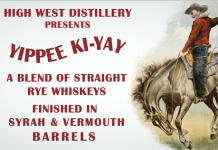 Initially, Diageo filed a label for The Gifted Horse Whiskey that had a 4 year age statement on the label. This makes sense as the age must reflect the youngest whiskey in the mix. They’ve since dropped the age statement and are focusing on the whiskey as a union of whiskeys rather than a singular age-stated spirit. This is a smart move as the ignorance among many consumers about age statements would only hinder a release labeled as 4 years. Even with so much information about how and where a whiskey is aged impacts its character, many consumers still chase the numbers. 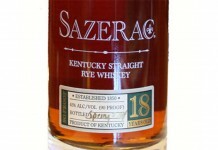 As with many of the Orphan Barrel releases, we don’t know the exact lineage of this blend. We do know that it comes from Diageo’s stock of whiskeys at Stitzel-Weller, where many of the Orphan Barrel releases have been stored. The Gifted Horse Whiskey label also indicates that it’s a blend of 39% 17 Year Old Whiskey and 61% “younger Corn Whiskey and Indiana Bourbon Whiskey”. Ultimately, the ingredients in a blend are far less important than how it all comes together in the glass. 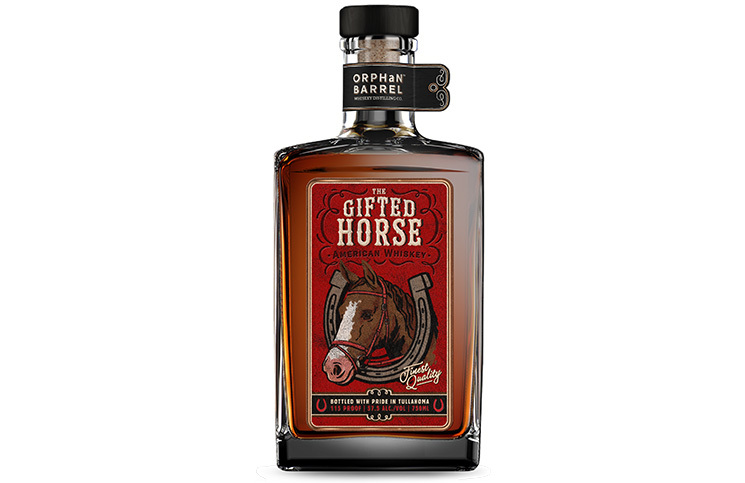 Orphan Barrel – The Gifted Horse American Whiskey (57.5 ABV, $50) – medium gold in color, this whiskey has an expressive nose. The signature apple note common to many of the Orphan Barrel releases is right there along with oak, cinnamon, maple, and marzipan. Unlike some of the other Orphan Barrel releases which tend to be oak bombs, The Gifted Horse has strong oak, but here it’s more integrated with greater complexity on the nose. The entry for The Gifted Horse is enjoyable. All the balance and integration on the nose are there in the opening with baked apple, marzipan, maple, cinnamon, clove, black pepper, and oak, all wrapped by a nice soft layer of caramel corn. The mouthfeel matches the solid opening with a nice roundness. Even at this high ABV, The Gifted Horse has a level of soft finesse on the palate that makes it enjoyable straight. After this slightly sweet and lush opening, The Gifted Horse takes a turn towards the spicy. The midpalate becomes a showcase for the union of oak and cinnamon, and an illustration of how much better these elements are when they are balanced. Beyond the cinnamon and oak is the support of the sweet caramel and baked apple, as well as other spices like clove and black pepper. It’s at the end of the midpalate that the issues from the 17 year old whiskey really show up. There’s a sharp varnish note that leaps out, showing that indeed the original 17 year old whiskey had lost its battle with the barrel. This tannic bite was handled well up to this point, but it breaks through. The varnished oak note drives a long and slightly dry finish. The Gifted Horse Whiskey answers an important question in the spirits industry: how do you release an older whiskey that has some nice character, but that has ultimately lost the battle with the oak cask? The answer is pretty simple – you blend it! An older, weathered whiskey can be revitalized when you mix with younger whiskeys, and the sum can be much stronger than its individual parts. Accident or not, The Gifted Horse Whiskey is an important test for the high end American whiskey market to see if consumers will set aside their desire for age statements in favor of an enjoyable whiskey that is a blend. 87 points.